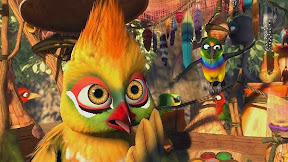 The second film produced by South Africa’s Triggerfish Animation Studios, this 3D amalgamation of The Lion King, Ice Age, Rio and Madagascar (which was ironically co-written by former Lion King screenwriter Jonathan Roberts), seems on the surface to target young, indiscriminating toddler-aged viewers fond of talking animal pictures. Unfortunately and despite Triggerfish’s at times absolutely breathtaking, authentic African magic hour-set animation, given the ferocious half-blind lion voiced by Liam Neeson who talks of ripping into the flesh of Disney star Jake T. Austin’s youthful eponymous zebra hero to claim his beating heart, Khumba is far too intense to be appropriate for cinema's youngest audience members. Yet at the same time, when you factor in the predictable nature of the overly-familiar storyline which in true Disney fashion kills off the mother and sends the young outsider on a multi-layered journey towards self-acceptance, it’s hard to imagine that older, somewhat discerning grade school aged children will find it interesting enough to tune into for its entire running time. Needless to say, it's hard to imagine just who Khumba is not only right for but also, who would like to watch it. Centering the action on our titular hero who’s been ostracized as a zebra who was born with stripes that cover only half his body, after Khumba’s dying mother tells him a soothing fairytale about a magical waterhole that is said to grant stripes, he sets out on a quest to become more like the rest. 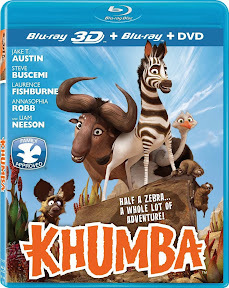 Bidding farewell to his superstitious tribe of zebras who blame their lack of water on Khumba’s “unnatural” appearance -- Khumba may head out on his own but quickly amasses a new tribe of fellow outsiders who tag along on the journey and help liven up the stale proceedings. 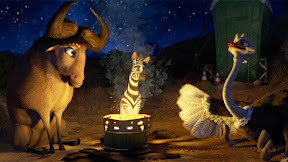 While a bit too on the nose in its moral lessons, moreover there’s a lot the audience is asked to forgive in Khumba that goes beyond its stale plotting. Specifically, it’s far too fond of stereotypical characterizations from casting Loretta Devine to voice the obligatory “wise black woman,” signing up Steve Buscemi to play a fast-talking east-coast sounding Italian American, and likewise relying on similar outdated devices in making Neeson’s villain disabled. While one could argue that Neeson's lion is blind because he "can't see" things for the way they are, the treatment of his character and the arc he takes doesn't play into that analysis as anything that's particularly that deep. Though of course it’s doubtful that children will read anything into these decisions made by the scientist turned writer/director Anthony Silverston and his fellow writers Raffaella Delle Donne as well as Jonathan Roberts as these same elements occur frequently in animated movies, because Khumba is so flawed in its lazy plotting, there aren’t many places for all of Khumba’s problems to hide. Despite this, it’s evident from the moment Khumba begins that as a studio, Triggerfish is definitely one to watch in the future given some of the superlative animation and striking use of 3D on display throughout the film. Unfortunately for Khumba and first-time feature filmmaker Silverston, the magic of those multi-dimensional black glasses and the gloriously crisp images that come to life before our eyes on Khumba's Blu-ray aren’t able to salvage it in any way that would make the film worthy of a recommendation.